Surprise! We're starting the April Fools Day celebration a bit early! As some of you may have already seen, we've replaced some of the character covers with fun "Young" cover variants, including characters like Captain America, Black Panther, and Iron Man. Increases damage dealt to Heroes. When one of Kraven's Countdown Tiles expires, create 2 Black Strike tiles. Players that log in between 4/1/19 12am EDT and 4/3/19 3pm EDT will receive a token to this store. 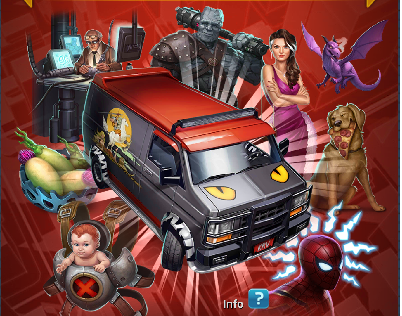 Spider-Man (Bag-Man) is swinging back into MPQ with his Versus Tournament, and players that log in between 3/31/19 8am EDT and 4/3/19 3pm EDT will receive a token to this event's vault.